Recline from either arm of this double reclining power sofa for a great way to relax at the end of the day. Pillow arms and pad-over chaise cushions provide full body support and comfort. 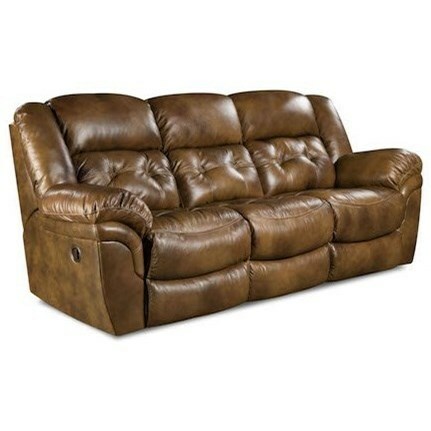 Top-grain leather covers the seating area of this piece and will give your room a nice quality look. Power reclining promotes ultimate comfort and puts you in control of the impressive positioning. The Cheyenne Casual Double Reclining Power Sofa with Pillow Arms by HomeStretch at Miskelly Furniture in the Jackson, Pearl, Madison, Ridgeland, Flowood Mississippi area. Product availability may vary. Contact us for the most current availability on this product. The Cheyenne collection is a great option if you are looking for Casual furniture in the Jackson, Pearl, Madison, Ridgeland, Flowood Mississippi area. Browse other items in the Cheyenne collection from Miskelly Furniture in the Jackson, Pearl, Madison, Ridgeland, Flowood Mississippi area.